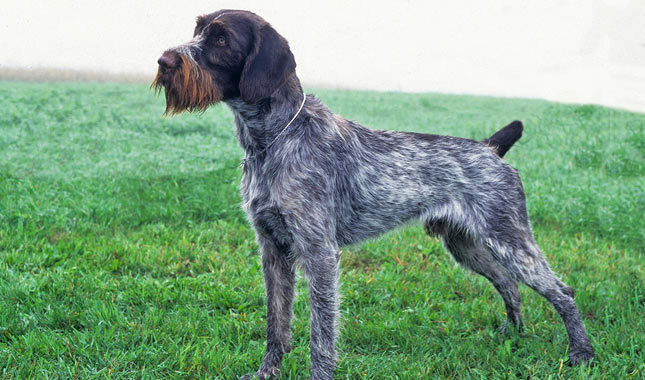 The German Wirehaired Pointer is a well muscled, medium sized dog of distinctive appearance. Balanced in size and sturdily built, the breed’s most distinguishing characteristics are its weather resistant, wire-like coat and its facial furnishings. Typically Pointer in character and style, the German Wirehaired Pointer is an intelligent, energetic and determined hunter. The shoulders are well laid back. The forelegs are straight with elbows close. Leg bones are flat rather than round, and strong, but not so heavy or coarse as to militate against the dog’s natural agility. Dewclaws are generally removed. Round in outline the feet are webbed, high arched with toes close, pads thick and hard, and nails strong and quite heavy. The angles of the hindquarters balances that of the forequarters. A straight line drawn vertically from the buttock (ischium) to the ground should land just in front of the rear foot. The thighs are strong and muscular. The hind legs are parallel when viewed from the rear. The hocks (metatarsus) are short, straight and parallel turning neither in nor out. Dewclaws are generally removed. Feet as in forequarters. The functional wiry coat is the breed’s most distinctive feature. A dog must have a correct coat to be of correct type. The coat is weather resistant and, to some extent, water-repellent. The undercoat is dense enough in winter to insulate against the cold but is so thin in summer as to be almost invisible. The distinctive outer coat is straight, harsh, wiry and flat lying, and is from one to two inches in length. The outer coat is long enough to protect against the punishment of rough cover, but not so long as to hide the outline of the dog. On the lower legs the coat is shorter and between the toes it is of softer texture. On the skull the coat is naturally short and close fitting. Over the shoulders and around the tail it is very dense and heavy. The tail is nicely coated, particularly on the underside, but devoid of feather. Eyebrows are of strong, straight hair. Beard and whiskers are medium length. The hairs in the liver patches of a liver and white dog may be shorter than the white hairs. A short smooth coat, a soft woolly coat, or an excessively long coat is to be severely penalized. While maintaining a harsh, wiry texture, the puppy coat may be shorter than that of an adult coat. Coats may be neatly groomed to present a dog natural in appearance. Extreme and excessive grooming to present a dog artificial in appearance should be severely penalized. The dog should be evaluated at a moderate gait. Seen from the side, the movement is free and smooth with good reach in the forequarters and good driving power in the hindquarters. The dog carries a firm back and exhibits a long, ground-covering stride. When moving in a straight line the legs swing forward in a free and easy manner and show no tendency to cross or interfere. There should be no signs of elbowing out. The rear legs follow on a line with the forelegs. As speed increases, the legs will converge toward a center line of travel. Click Here to Learn about breeder background checks on German Wirehaired Pointer breeders if you are looking for German Wirehaired Pointer puppies for sale. Click Here to learn how ResearchBreeder.com can help you find healthy German Wirehaired Pointer puppies for sale. Click Here to order a Breeder or Kennel Background Check on German Wirehaired Pointer Breeders that may have German Wirehaired Pointer puppies for sale. Click here to find the national breed club for German Wirehaired Pointer puppies for sale. Click Here to purchase a list of approved ResearchBreeder.com German Wirehaired Pointer Breeders who have German Wirehaired Pointer puppies for sale.